For the modern business traveler, the last decade has provided extraordinary leaps forward in telecommunications technology. The two dominant telecom storylines of the last 10 years have been the meteoric rise of VoIP and the global march toward mobile communication. For the international business traveler, combining these two game-changing concepts is finally a cost-effective, practical reality. Extending a business office's VoIP setup to reach its representatives wherever their business takes them is now standard practice, even for smaller businesses on a budget. 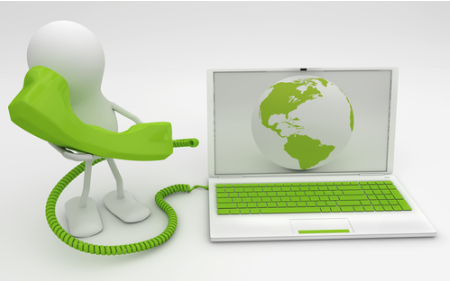 Often referred to as "Internet phone" or simply "online calling," VoIP is defined by the FCC as a system that places calls over a broadband Internet connection — as opposed to over an analog phone line — by converting the user's voice into a digital signal, which is then sent over the Internet before being converted back to a regular telephone signal. Basic, experimental versions of the technology existed for years before, but companies such as Skype made the process familiar not just to businesses and consumers alike, starting around 2004. Voice over IP is wildly popular with both individuals and businesses for good reason. It requires less than one-sixth the bandwidth to transmit (10 kbps one way for voIP vs 64 kbps for phones). Upgrades are done through simple software rather than through purchasing and installing expensive and complicated hardware or phone lines and most VoIP providers offer extra services like call waiting and call forwarding for free. The biggest and most obvious incentive, however, is cost. VoIP-to-VoIP calling is free, and fees for calling landlines or mobiles are nominal and charged by the minute. Standard lines come with expensive contracts to be paid monthly, often with roaming or long-distance charges and international rates that vary by company and country. Call-forwarding — or call diverting or redirecting — has been a staple of telephony since it was invented by Ernest J Bonanno in 1963. Call forwarding routes incoming calls — either internally or through a contracted third-party company — from the number dialed by the call's originator to a predetermined alternate number or numbers. One of the top selling points of VoIP technology is that features such as call forwarding often come for free as part of a standard package, as opposed to traditional public switched telephone network — or PSTN — plans that charge for each call forwarded. This has been the standard method for mobile business professionals seeking to bring their VoIP system with them when they travel. But today, there are even more options. As providers of business-communication systems hustle to keep up with a world that is quickly going mobile, providers are beginning to release apps that bring the entirety of a full-service VoIP suite to a user's mobile phone. The next generation of apps, already being released in 2014, combine voice, video and chat in a single platform that can be accessed from any user's tablet, PC, Mac or smartphone. Giving the user full control over settings such as primary call forwarding and location, these apps may be poised to replace the third-party call-forwarding standard that has, until recently, been the primary option. VoIP is muscling in on more and more of the PSTN market every year — and for good reason. Although there is still no replacement for the iron-clad reliability and clarity of a landline, VoIP is a cost-effective, customizable, multi-media platform that doesn't require large hardware investments and can be updated through simple software upgrades. With call forwarding and, most recently, VoIP mobile apps, business travelers can bring their office's VoIP systems with them wherever their business takes them. ElectricalOutlet.org lists international electrical plugs and outlets. Electrical outlets are compatible with the types of electrical plugs listed in comments. If you have a different kind of plug, an adapter plug may be necessary. Get Toll Free with no setup fees. Toll Free can be yours today, with TollFreeForwarding.com. Electrical voltage is listed for each country, but keep in mind electrical power systems are prone to slight variations. Use appliances only in the correct electrical receptacles, or find a compatible travel plug if your electric plug won't work. Call Forwarding with real-time call records. Call Forwarding with no obligation and free trial. Frequency is shown in the number of hertz, or cycles per second. Check that the wall plug is compatible with your electronics. Otherwise, you may need to find a plug adaptor to lower the internal current. Adapters cannot, however, change the number of cycles. It's easy to get UK phone numbers without contracts. UK Phone Number with TollFreeForwarding.com makes it easier for your customers to reach you. Electrical wiring and electric plugs differ from country to country. If your appliance uses a different kind of plug power, an electrical transformer is sometimes necessary, though not always practical for travel. Electrical wiring differs around the world. ElectricalOutlet.org lists electric plugs you may encounter in your travels. An electric plug is inserted into an electrical socket, or electric receptacle. An electrical outlet may also be referred to as an electrical receptacle, or electric sockets. Before you travel, ensure your prong plug will work in the electrical sockets in the country you're visiting. Electrical power varies from country to country. Even if your devices use the same electric outlets or plug type, it's a good idea to make sure voltage and frequency are compatible. If they are not, you may need an electric converter. Electrical receptacles around the world will have different electrical voltage and power frequency. ElectricalOutlet.org lists information on any plug variants, or plug types. Read the comments section to find relevant wall electrical information, and voltage frequency. You may need a plug travel adaptor or electric converters for your electronics to work while you travel.